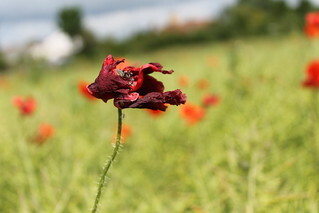 Red shriek the poppies in the green fields of Poland. Death lies in wait in the black forests of Poland. The reapers are all dead. The children cry for bread. The Shofar for the supplicants beneath the ground? The hundred thousands God alone can name. How shall they be entered into Heaven’s book aright? Tonight, as we light the last light. Image: Burn, copyright 2012 by Amy Ischt-Lipscombe. The numerous poems she wrote for the Vossische and for the Berliner Tageblatt over the years made her a celebrity in the capital. Hermann Hesse, Thomas Mann and Alfred Polgar all expressed their admiration. She read her poems at the KüKa (Artists’ Cabaret), where stars such as Rosa Valetti and Tatjana Sais sang her chansons, which became popular for their combination of quick Berlin wit and the melancholy of Jewish Eastern Europe. Public response was so enthusiastic that the Rowohlt publishing house put out her first book of poetry, The Lyrical Shorthand Pad (Das Lyrische Stenogrammheft) in 1933. This was followed two years later by The Little Reader for Grown-Ups (Kleine Lesebuch für Grosse). In Polens schwarzen Wäldern lauert Tod. Die sie gesät, sie starben. Vom Nest verscheucht, die kleinen Vögel schweigen. Und die nur Gott allein bei Namen kennt. Sie alle aus dem Lebensbuch zu streichen. Herr, mög der Bäume Beten dich erreichen. … so much more moving than John McCrae’s romanticized In Flanders’ Fields, where the animate dead urge the living, “Take up our quarrel with the foe.” Mourn the dead, rather. More of Kaléko’s poems, in German, are available here; Andreas Nolte has translated a number into English, some of which are available here. Nolte’s translations are published all together in his book, “‘No matter where I travel, I come to Nowhereland’ – The Poetry of Mascha Kaléko,” but I have not found a copy. Verse für Zeitgenossen, whose copyright was registered in 1946 and not renewed, is in the public domain in the United States. This entry was posted in death, poem, Translation and tagged death, Jewish Poetry, Kaddish, Mascha Kaleko, poem, translation by Thomas Kearney. Bookmark the permalink.